Decorating the house for Easter is a relatively inexpensive way to celebrate a special time of year. Traditionally it's when the entire family gets together, and as events are so focused around children, it's a good time to let the imagination go wild with bunnies, birds and rabbits. Yellow and white are always key colours and can be made more playful with a few carefully selected accessories and pieces of tableware. Mango Wood Hanging Eggs, £18, Glitter Hanging Rabbit Pack of 2, £4, Coloured Foam Bird Assortment, £5. All John Lewis. Create a feature of the mantelpiece with a collection of coloured vases holding a few spring flowers. A branch collected from the garden makes an excellent 'Easter' tree and can be hung with a selection of eggs, birds and other farmyard animals. Grass Table Runner, £18, White Decorative Tree, £15, Woolly Sheep, £20, Tabletop Carrot Crackers, £10, Boing Bunny, £9. All John Lewis. 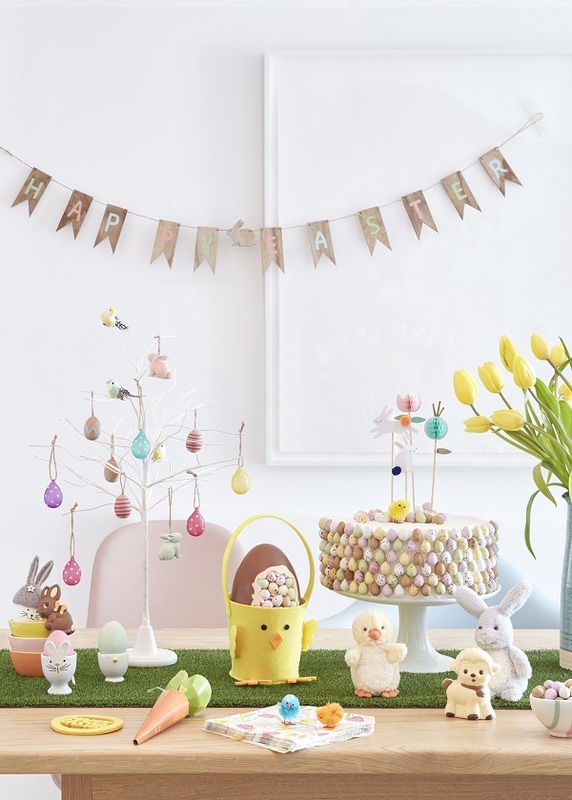 Hang a festive banner above the table and decorate with chicks and rabbits on a grass runner. We love this! Easter Wreath, £25, White Decorative Tree, £15, Both John Lewis. The twig trees that have started to be very popular at Christmas come into their own at this time of year. Decorate with a selection of hanging Easter decorations and hang an Easter wreath on the door. All products are from a selection at John Lewis.